Make the connection between school and home stronger with these school-to-home two-pocket folders. Keep parents and caregivers informed with daily updates on lessons, projects, behavior and more. The interior pockets are imprinted with ‘Home’ and ‘School’ designations, in both English and Spanish. Front and back cover pockets are clear, making them great for custom student cover sheets. Made of durable, acid-free polypropylene. Assorted colors include red, orange, yellow, green, blue and purple. Hi, I'm Jen at C-Line and today we're going to be talking about C-Line's new Classroom Connector School-To-Home Folders. Make the connection between school and home stronger with these colorful two-pocket folders. Keep parents and caregivers informed with daily updates on lessons, projects, behaviors and more. The interior pockets are printed with School and Home and Left and Right. Plus these colorful folders are printed in English and Spanish for bilingual families. Use the left pocket to send home projects and papers that stay at home. And the right pocket to bring home projects and papers that need to be reviewed and then returned back to school. Pretty clever, huh? The clear pockets on the front and back covers allow children to get creative and customize their own inserts. 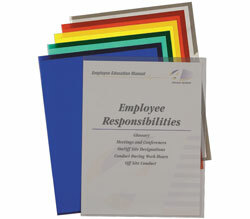 Classroom Connector folders are made from super heavyweight polypropylene and are available in an assortment of primary colors. Keep parents and teachers connected with C-Line's new Classroom Connector School-To-Home Folders. Order yours now! That's all the time we have for today. I'm Jen at C-Line and thanks for watching.